Packed with apples, imported cinnamon and other spices. Great for breakfast, with ice cream, a slice of cheddar. For those who want their scone and their chocolate in one fell swoop. Loaded with semisweet chocolate chips in every bite!! The perfect after school snack, kids of all ages will love them!! Tart, chewy cranberries, a hint of orange rind and a touch of nutmeg. A surprising taste and one you'll want more of. Fresh ginger is the star of this scone, supported admirably by a burst of succulent lemon. Lavender Scones - 1 Tbsp of Lavender to the 3/4 cup of water needed to make scones. Heat Water 200°F , Steep for 5 min. Allow brewed lavender to cool down before adding it to the scone mix. Lots of sunkissed lemon, heaps of poppyseeds, loads of flavor, texture and crunch.. Dried cherries and chocolate chips make for an irresistible combination in these delectable scones. Pair them with vanilla ice cream for a new twist on dessert. No need to wait 'til Fall. Pumpkins, cranberries and spices light up any season in this unusual scone. A nice summertime scone. Try fresh baked strawberry scones with vanilla ice cream, lemon curd and fresh sliced strawberries. whip cream is optional. If you’ve got gluten-free kids, then this scone is for you. Chocolate chips star in this not-too-sweet treat that’s perfect for lunch boxes or after-school snacks. Bonus: Parents love them too. The pleasing pumpkin taste and bright cranberries in these scones will have you dreaming of cool days and crunchy leaves. Pair with a cup of coffee for a perfect mid-morning snack.. Mix: In bowl, add 3/4 cup of water to entire mix. Stir with fork until water is completely combined and sticky dough forms. Drop heaping tablespoons of dough ( about 12 ) onto pan. Turn out dough into 9-inch pie plate and press evenly onto bottom and out to the sides. Score deeply, but not quite through, to make wedges. Bake 18-20 minutes. 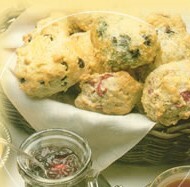 Serve scones warm with curd or jam... and tea!